Like many of you, I have been struggling with the news coming out of New Zealand a week or so ago. Fifty people were killed in an act of terror on two mosques in Christchurch, New Zealand. The victims’ only crime was gathering as Muslims for prayer. The attack was perpetrated by a man who identifies as a white nationalist, a resister to the alleged global effort to exterminate white people. His manifesto, meant to inspire others in the cause, was itself inspired by (among other influences) white nationalist rhetoric, efforts, and validations here in the United States. For a week the entire nation of New Zealand has been mourning fifty people killed in the name of hate. I’ve been preoccupied with this news this week, and with the unimpeded rise in dangerous racist sentiment here and around the world. As a Christian, I also am underwhelmed by the response of the Church to moments like these. To be sure, many Christian denominations came out immediately with thoughtful and earnest denunciations of the violence and expressions of genuine sympathy and concern for the victims of this tragedy, and for New Zealand as a national community. But many of those statements strike my ear as somewhat innocuous, expressing genuine sorrow but not quite capturing the anger I have in moments like these. Our hearts go out to our Muslim sisters and brothers.… We must put an end to the violence…. Is this all that Christians can say? 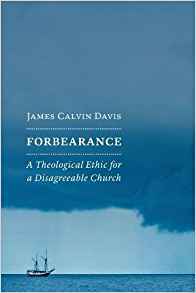 James Davis’s newest book, Forbearance: A Theological Ethic for a Disagreeable Church, is available now from Eerdmans.